BERLIN (Reuters) - Several senior German conservatives called on Saturday for their party to shift to the right to win back voters, throwing down the gauntlet to Chancellor Angela Merkel before she announces her choice of cabinet ministers on Sunday. The Christian Democrats (CDU) vote at a party meeting on Monday on whether to back a coalition deal with the Social Democrats (SPD), which would hand Merkel a fourth term at the top of a grand coalition and keep them in office for another four years. SPD members also have to vote on the agreement. Although the CDU is widely expected to back the deal - and approve Merkel's ally, Annegret Kramp-Karrenbauer, as CDU general secretary - there are rumblings among conservatives that the party needs fresh blood and a new political direction. "Sometimes the conservative element of the conservative bloc could be more prominent," CDU premier of the state of Schleswig Holstein, Daniel Guenther, told the Neue Osnabruecker newspaper. Senior Bavarian CSU conservative Alexander Dobrindt told the Passauer Neue Presse: "The conservative bloc must cover the spectrum from the center to the democratic right." 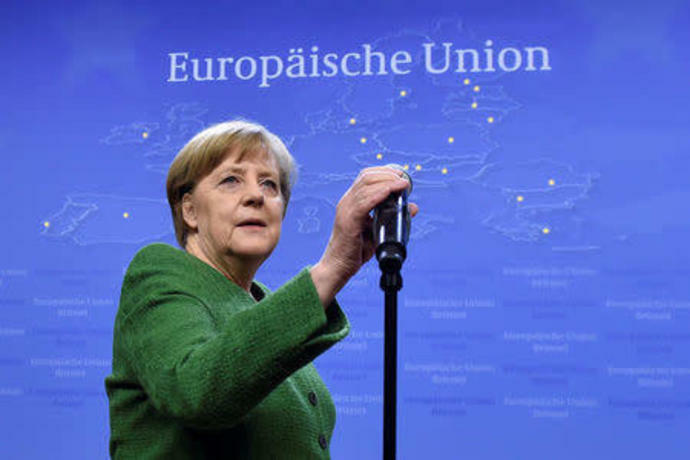 Merkel has drawn most criticism for a bailout of Greece in the euro zone debt crisis and her open-door migrant policy. Her conservatives bled support to the far-right in the Sept. 24 election, slumping to their lowest level since 1949. Her six cabinet picks from her CDU will send a signal about the direction of policy in the next four years. Long-standing ally Peter Altmaier is widely tipped to take over the economy ministry and Ursula von der Leyen to keep defense. One question is whether Jens Spahn, 37, an arch-conservative state secretary in the finance ministry, who spoke out against Merkel's refugee policy, will get a post. The CSU and SPD will announce their cabinet posts later. In her 12 years as chancellor and nearly 18 years as party leader, Merkel has positioned the CDU in the center ground. But many are looking to a post-Merkel era and handing the powerful finance and foreign ministries to the SPD to secure a coalition deal further undermined her authority. To ward off critics, she has promised "renewal" in her team. Merkel took a step towards backing a successor by announcing Saarland state premier Kramp-Karrenbauer, 55, as her choice for CDU secretary general. Dubbed "mini-Merkel" by some media, Kramp-Karrenbauer may not be different enough for some in the party. However, her Catholic, western German background contrasts with Merkel's Protestant, eastern roots. While socially conservative, known for opposing gay marriage, Kramp-Karrenbauer is a strong supporter of the minimum wage and workers rights. Before she can formally form a government, Merkel needs SPD members to vote 'yes' in a postal ballot for a renewal of the 2013-2017 grand coalition. The outcome, to be announced on March 4, is unclear although there are some signs that the deal will go through. If SPD members reject the deal, the most likely scenarios are a new election or a minority government. Andrea Nahles, who is likely to be chosen as SPD leader in April, campaigned for a 'yes' vote in Potsdam on Saturday as part of a nationwide tour. "Critics spoke out ... But I am pleased to say there was a clear majority here for 'yes' which gives us momentum in the last few days in our push for a majority," she said. Many members are reluctant to share power with Merkel again, fearing voters will punish them after their worst post-war result in the September election which has led to deep divisions in the party, a leadership row and a further slump in the polls. The SPD's Jusos youth wing, led by Kevin Kuehnert, is on its own 'no grand coalition' tour. In a bid to heal the SPD's deep wounds, some leading figures, including Foreign Minister Sigmar Gabriel, called for Kuehnert to have a big role in future.